The 2015 Nobel Prize in Chemistry was awarded to Tomas Lindahl, Paul Modrich, and Aziz Sancar for their work on the molecular mechanisms of DNA repair processes. There are two types: nucleotide excision repair and base excision repair. It is important to distinguish between DNA damage and mutation, the two major types of error in DNA. DNA damages and mutation are fundamentally different. Damages are physical abnormalities in the DNA, such as single- and double-strand breaks, 8-hydroxydeoxyguanosine residues, and polycyclic aromatic hydrocarbon adducts. DNA damages can be recognized by enzymes, and, thus, they can be correctly repaired if redundant information, such as the undamaged sequence in the complementary DNA strand or in a homologous chromosome, is available for copying. If a cell retains DNA damage, transcription of a gene can be prevented, and, thus, translation into a protein will also be blocked. Replication may also be blocked or the cell may die. Given these properties of DNA damage and mutation, it can be seen that DNA damages are a special problem in non-dividing or slowly dividing cells, where unrepaired damages will tend to accumulate over time. On the other hand, in rapidly dividing cells, unrepaired DNA damages that do not kill the cell by blocking replication will tend to cause replication errors and thus mutation. The great majority of mutations that are not neutral in their effect are deleterious to a cell's survival. Thus, in a population of cells composing a tissue with replicating cells, mutant cells will tend to be lost. However, infrequent mutations that provide a survival advantage will tend to clonally expand at the expense of neighboring cells in the tissue. This advantage to the cell is disadvantageous to the whole organism, because such mutant cells can give rise to cancer. 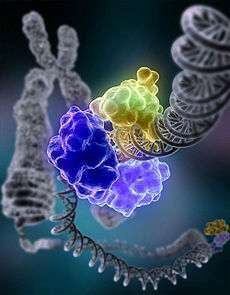 Thus, DNA damages in frequently dividing cells, because they give rise to mutations, are a prominent cause of cancer. 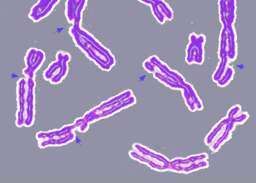 In contrast, DNA damages in infrequently dividing cells are likely a prominent cause of aging. Nucleotide excision repair (NER) repairs damaged DNA which commonly consists of bulky, helix-distorting damage, such as pyrimidine dimerization caused by UV light. Damaged regions are removed in 12-24 nucleotide-long strands in a three-step process which consists of recognition of damage, excision of damaged DNA both upstream and downstream of damage by endonucleases, and resynthesis of removed DNA region. NER is a highly evolutionarily conserved repair mechanism and is used in nearly all eukaryotic and prokaryotic cells. In prokaryotes, NER is mediated by Uvr proteins. In eukaryotes, many more proteins are involved, although the general strategy is the same. MMEJ starts with short-range end resection by MRE11 nuclease on either side of a double-strand break to reveal microhomology regions. In further steps, PARP1 is required and may be an early step in MMEJ. There is pairing of microhomology regions followed by recruitment of flap structure-specific endonuclease 1 (FEN1) to remove overhanging flaps. This is followed by recruitment of XRCC1–LIG3 to the site for ligating the DNA ends, leading to an intact DNA. DNA double strand breaks in mammalian cells are primarily repaired by homologous recombination (HR) and non-homologous end joining (NHEJ). In an in vitro system, MMEJ occurred in mammalian cells at the levels of 10–20% of HR when both HR and NHEJ mechanisms were also available. MMEJ is always accompanied by a deletion, so that MMEJ is a mutagenic pathway for DNA repair. A team of French researchers bombarded Deinococcus radiodurans to study the mechanism of double-strand break DNA repair in that bacterium. At least two copies of the genome, with random DNA breaks, can form DNA fragments through annealing. Partially overlapping fragments are then used for synthesis of homologous regions through a moving D-loop that can continue extension until they find complementary partner strands. In the final step there is crossover by means of RecA-dependent homologous recombination. Translesion synthesis (TLS) is a DNA damage tolerance process that allows the DNA replication machinery to replicate past DNA lesions such as thymine dimers or AP sites. 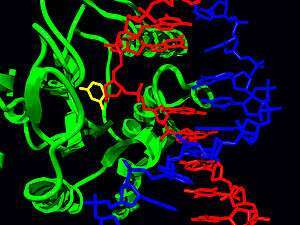 It involves switching out regular DNA polymerases for specialized translesion polymerases (i.e. DNA polymerase IV or V, from the Y Polymerase family), often with larger active sites that can facilitate the insertion of bases opposite damaged nucleotides. The polymerase switching is thought to be mediated by, among other factors, the post-translational modification of the replication processivity factor PCNA. Translesion synthesis polymerases often have low fidelity (high propensity to insert wrong bases) on undamaged templates relative to regular polymerases. However, many are extremely efficient at inserting correct bases opposite specific types of damage. For example, Pol η mediates error-free bypass of lesions induced by UV irradiation, whereas Pol ι introduces mutations at these sites. Pol η is known to add the first adenine across the T^T photodimer using Watson-Crick base pairing and the second adenine will be added in its syn conformation using Hoogsteen base pairing. From a cellular perspective, risking the introduction of point mutations during translesion synthesis may be preferable to resorting to more drastic mechanisms of DNA repair, which may cause gross chromosomal aberrations or cell death. In short, the process involves specialized polymerases either bypassing or repairing lesions at locations of stalled DNA replication. For example, Human DNA polymerase eta can bypass complex DNA lesions like guanine-thymine intra-strand crosslink, G[8,5-Me]T, although can cause targeted and semi-targeted mutations. Paromita Raychaudhury and Ashis Basu studied the toxicity and mutagenesis of the same lesion in Escherichia coli by replicating a G[8,5-Me]T-modified plasmid in E. coli with specific DNA polymerase knockouts. Viability was very low in a strain lacking pol II, pol IV, and pol V, the three SOS-inducible DNA polymerases, indicating that translesion synthesis is conducted primarily by these specialized DNA polymerases. A bypass platform is provided to these polymerases by Proliferating cell nuclear antigen (PCNA). Under normal circumstances, PCNA bound to polymerases replicates the DNA. At a site of lesion, PCNA is ubiquitinated, or modified, by the RAD6/RAD18 proteins to provide a platform for the specialized polymerases to bypass the lesion and resume DNA replication. After translesion synthesis, extension is required. This extension can be carried out by a replicative polymerase if the TLS is error-free, as in the case of Pol η, yet if TLS results in a mismatch, a specialized polymerase is needed to extend it; Pol ζ. Pol ζ is unique in that it can extend terminal mismatches, whereas more processive polymerases cannot. So when a lesion is encountered, the replication fork will stall, PCNA will switch from a processive polymerase to a TLS polymerase such as Pol ι to fix the lesion, then PCNA may switch to Pol ζ to extend the mismatch, and last PCNA will switch to the processive polymerase to continue replication. Cancer therapy procedures such as chemotherapy and radiotherapy work by overwhelming the capacity of the cell to repair DNA damage, resulting in cell death. Cells that are most rapidly dividing — most typically cancer cells — are preferentially affected. The side-effect is that other non-cancerous but rapidly dividing cells such as progenitor cells in the gut, skin, and hematopoietic system are also affected. Modern cancer treatments attempt to localize the DNA damage to cells and tissues only associated with cancer, either by physical means (concentrating the therapeutic agent in the region of the tumor) or by biochemical means (exploiting a feature unique to cancer cells in the body). In further examples (tabulated in Table 4 of this reference), epigenetic defects were found at frequencies of between 13%-100% for the DNA repair genes BRCA1, WRN, FANCB, FANCF, MGMT, MLH1, MSH2, MSH4, ERCC1, XPF, NEIL1 and ATM. These epigenetic defects occurred in various cancers (e.g. breast, ovarian, colorectal and head and neck). Two or three deficiencies in the expression of ERCC1, XPF or PMS2 occur simultaneously in the majority of the 49 colon cancers evaluated by Facista et al. 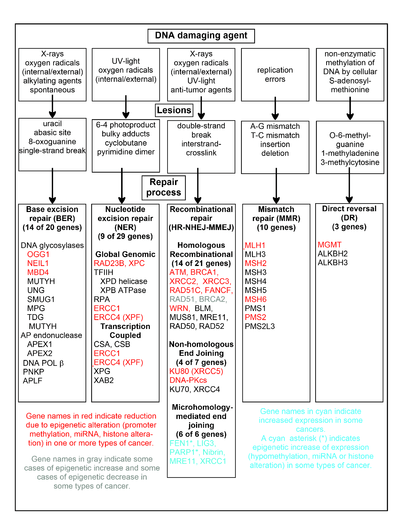 Some of the more well studied genes central to these repair processes are shown in the chart. The gene designations shown in red, gray or cyan indicate genes frequently epigenetically altered in various types of cancers. Wikipedia articles on each of the genes high-lighted by red, gray or cyan describe the epigenetic alteration(s) and the cancer(s) in which these epimutations are found. Two review articles, and two broad experimental survey articles also document most of these epigenetic DNA repair deficiencies in cancers. Cyan-highlighted genes are in the microhomology-mediated end joining (MMEJ) pathway and are up-regulated in cancer. MMEJ is an additional error-prone inaccurate repair pathway for double-strand breaks. In MMEJ repair of a double-strand break, an homology of 5-25 complementary base pairs between both paired strands is sufficient to align the strands, but mismatched ends (flaps) are usually present. MMEJ removes the extra nucleotides (flaps) where strands are joined, and then ligates the strands to create an intact DNA double helix. MMEJ almost always involves at least a small deletion, so that it is a mutagenic pathway. FEN1, the flap endonuclease in MMEJ, is epigenetically increased by promoter hypomethylation and is over-expressed in the majority of cancers of the breast, prostate, stomach, neuroblastomas, pancreas, and lung. PARP1 is also over-expressed when its promoter region ETS site is epigenetically hypomethylated, and this contributes to progression to endometrial cancer, BRCA-mutated ovarian cancer, and BRCA-mutated serous ovarian cancer. Other genes in the MMEJ pathway are also over-expressed in a number of cancers (see MMEJ for summary), and are also shown in cyan. On some occasions, DNA damage is not repaired, or is repaired by an error-prone mechanism that results in a change from the original sequence. When this occurs, mutations may propagate into the genomes of the cell's progeny. Should such an event occur in a germ line cell that will eventually produce a gamete, the mutation has the potential to be passed on to the organism's offspring. The rate of evolution in a particular species (or, in a particular gene) is a function of the rate of mutation. As a consequence, the rate and accuracy of DNA repair mechanisms have an influence over the process of evolutionary change. Since the normal adaptation of populations of organisms to changing circumstances (for instance the adaptation of the beaks of a population of finches to the changing presence of hard seeds or insects) proceeds by gene regulation and the recombination and selection of gene variations – alleles – and not by passing on irreparable DNA damages to the offspring, DNA damage protection and repair does not influence the rate of adaptation by gene regulation and by recombination and selection of alleles. On the other hand, DNA damage repair and protection does influence the rate of accumulation of irreparable, advantageous, code expanding, inheritable mutations, and slows down the evolutionary mechanism for expansion of the genome of organisms with new functionalities. The tension between evolvability and mutation repair and protection needs further investigation. A technology named clustered regularly interspaced short palindromic repeat shortened to CRISPR-Cas9 was discovered in 2012. The new technology allows anyone with molecular biology training to alter the genes of any species with precision. 1 2 Lodish H, Berk A, Matsudaira P, Kaiser CA, Krieger M, Scott MP, Zipursky SL, Darnell J. (2004). Molecular Biology of the Cell, p963. WH Freeman: New York, NY. 5th ed. 1 2 Acharya, PV (1971). "The isolation and partial characterization of age-correlated oligo-deoxyribo-ribonucleotides with covalently linked aspartyl-glutamyl polypeptides.". Johns Hopkins medical journal. Supplement (1): 254–60. PMID 5055816. 1 2 Bjorksten, J; Acharya, PV; Ashman, S; Wetlaufer, DB (1971). "Gerogenic fractions in the tritiated rat.". Journal of the American Geriatrics Society. 19 (7): 561–74. doi:10.1111/j.1532-5415.1971.tb02577.x. PMID 5106728. ↑ Browner, WS; Kahn, AJ; Ziv, E; Reiner, AP; Oshima, J; Cawthon, RM; Hsueh, WC; Cummings, SR. (2004). "The genetics of human longevity". Am J Med. 117 (11): 851–60. doi:10.1016/j.amjmed.2004.06.033. PMID 15589490. ↑ Broad, William J. (7 October 2015). "Nobel Prize in Chemistry Awarded to Tomas Lindahl, Paul Modrich and Aziz Sancar for DNA Studies". New York Times. Retrieved 7 October 2015. ↑ Madigan MT, Martino JM (2006). Brock Biology of Microorganisms (11th ed.). Pearson. p. 136. ISBN 0-13-196893-9. ↑ Campisi J, d'Adda di Fagagna F (2007). "Cellular senescence: when bad things happen to good cells.". Rev Mol Cell Biol. 8 (9): 729–40. doi:10.1038/nrm2233. PMID 17667954. 1 2 3 Best, Benjamin P (2009). 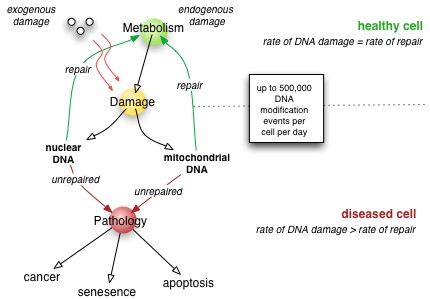 "Nuclear DNA damage as a direct cause of aging" (PDF). Rejuvenation Research. 12 (3): 199–208. doi:10.1089/rej.2009.0847. PMID 19594328. 1 2 3 Willey, J; Sherwood, L; Woolverton, C (2014). Prescott’s Microbiology. New York, New York: McGraw Hill. p. 381. ISBN 978-0-07-3402-40-6. 1 2 3 4 Reardon, J; Sancar, A (2006). "Purification and Characterization of Escherichia coli and Human Nucleotide Excision Repair Enzyme Systems". Methods in Enzymology. 408: 189–213. doi:10.1016/S0076-6879(06)08012-8. PMID 16793370. ↑ Moore JK, Haber JE (May 1996). "Cell cycle and genetic requirements of two pathways of nonhomologous end-joining repair of double-strand breaks in Saccharomyces cerevisiae". Molecular and Cellular Biology. 16 (5): 2164–73. PMC 231204 . PMID 8628283. ↑ Sharma S, Javadekar SM, Pandey M, Srivastava M, Kumari R, Raghavan SC (2015). "Homology and enzymatic requirements of microhomology-dependent alternative end joining". Cell Death Dis. 6: e1697. doi:10.1038/cddis.2015.58. PMC 4385936 . PMID 25789972. ↑ P Raychaudhury; Basu, Ashis K. (2011). "Genetic requirement for mutagenesis of the G[8,5-Me]T cross-link in Escherichia coli: DNA polymerases IV and V compete for error-prone bypass". Biochemistry. 50 (12): 2330–2338. doi:10.1021/bi102064z. PMID 21302943. ↑ "Translesion Synthesis". Research.chem.psu.edu. Archived from the original on 2012-03-10. Retrieved 2012-08-14. ↑ Wei, Qingyi; Lei Li; David Chen (2007). 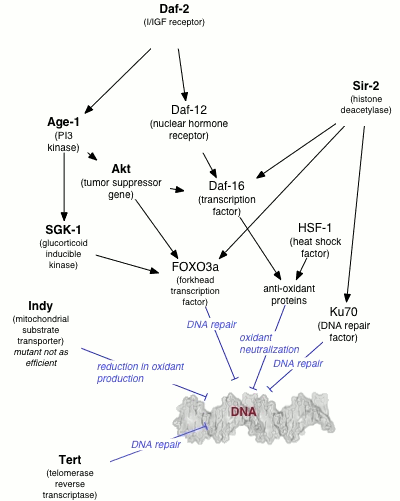 DNA Repair, Genetic Instability, and Cancer. World Scientific. ISBN 981-270-014-5. ↑ Schonthal, Axel H. (2004). Checkpoint Controls and Cancer. Humana Press. ISBN 1-58829-500-1. 1 2 Erill, I; Campoy, S; Barbé, J (2007). "Aeons of distress: an evolutionary perspective on the bacterial SOS response". FEMS Microbiol Rev. 31 (6): 637–656. doi:10.1111/j.1574-6976.2007.00082.x. PMID 17883408. ↑ Johnson, George (28 December 2010). "Unearthing Prehistoric Tumors, and Debate". The New York Times. If we lived long enough, sooner or later we all would get cancer. ↑ Alberts, B; Johnson A; Lewis J; et al. (2002). "The Preventable Causes of Cancer". Molecular biology of the cell (4th ed.). New York: Garland Science. ISBN 0-8153-4072-9. A certain irreducible background incidence of cancer is to be expected regardless of circumstances: mutations can never be absolutely avoided, because they are an inescapable consequence of fundamental limitations on the accuracy of DNA replication, as discussed in Chapter 5. If a human could live long enough, it is inevitable that at least one of his or her cells would eventually accumulate a set of mutations sufficient for cancer to develop. ↑ Baylin SB; Ohm, Joyce E. (February 2006). "Epigenetic gene silencing in cancer - a mechanism for early oncogenic pathway addiction?". Nat. Rev. Cancer. 6 (2): 107–16. doi:10.1038/nrc1799. PMID 16491070. ↑ Bernstein C, Prasad AR, Nfonsam V, Bernstein H. (2013). "Chapter 16: DNA Damage, DNA Repair and Cancer", New Research Directions in DNA Repair, Prof. Clark Chen (Ed. ), ISBN 978-953-51-1114-6, InTech. ↑ Xinrong Chen and Tao Chen (2011). "Chapter 18: Roles of MicroRNA in DNA Damage and Repair", DNA Repair, Inna Kruman (ed. ), ISBN 978-953-307-697-3, InTech. ↑ Singh P, Yang M, Dai H, Yu D, Huang Q, Tan W, Kernstine KH, Lin D, Shen B (2008). "Overexpression and hypomethylation of flap endonuclease 1 gene in breast and other cancers". Mol. Cancer Res. 6 (11): 1710–7. doi:10.1158/1541-7786.MCR-08-0269. PMC 2948671 . PMID 19010819. ↑ Bi FF, Li D, Yang Q (2013). "Hypomethylation of ETS transcription factor binding sites and upregulation of PARP1 expression in endometrial cancer". Biomed Res Int. 2013: 946268. doi:10.1155/2013/946268. PMC 3666359 . PMID 23762867. ↑ Cromie, GA; Connelly, JC; Leach, DR (2001). "Recombination at double-strand breaks and DNA ends: conserved mechanisms from phage to humans". Mol Cell. 8 (6): 1163–74. doi:10.1016/S1097-2765(01)00419-1. PMID 11779493.